"Paw Fist Star" beanie, for the liberation of both human and non-human animals! In our opinion these two goals must go hand in hand (or fist in paw, hoof in paw etc.) and we can only reach them together. The animal rights and animal liberation motif "Paw Fist Star" represents this fight and underlines that the vegan idea cannot be narrowed to readinig lists of ingredients, buying expensive food processors or superfoods. No, we believe that veganism does also mean our attempt to end exploitative circumstances! The beanies are part of the Stanley&Stella collection and was produced in eco-friendly factories. The energy used by the factories comes from renewable sources. The cotton is 100 % organic and was manufactured under fair conditions. The farmers don't only grow cotton but also food plants. So they do not only depend on the cotton market. 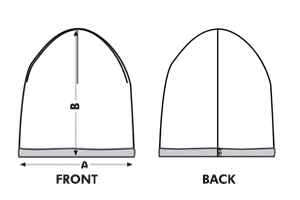 The caps are shipped by land or sea. Apart from the ecological quality, Stanley&Stella's factories were also certified by the Fair Wear Foundation. The farmers carry a fair wage and receive premiums.